No. 19/17 LSU’s Brittnee Cooper and Marina Skender combined for 36 of the team’s 52 kills en route to a 3-1 (24-26, 25-23, 25-19, 25-17) win against the No. 10/11 University of Florida volleyball team on Friday evening in the Stephen C. O’Connell Center. 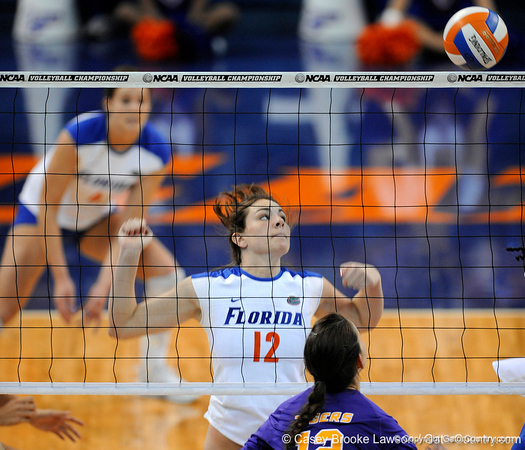 The Gators (20-4, 14-3 Southeastern Conference) were led by sophomore outside hitter Kristy Jaeckel, who turned in a team-high 18 kills as one of three Florida players in double-figure kills. Jaeckel also added nine digs and three blocks for a team-high 20.5 points. Sophomore right-side/setter Kelly Murphy charted her NCAA Division I leading eighth triple-double of the season and the 14th of her career with 13 kills on .333 hitting with 29 assists and 15 digs. Sophomore outside hitter Colleen Ward followed with 11 kills and seven digs. Senior libero Elyse Cusack finished with a match-high 20 digs and became just the third player in SEC history to eclipse the 2,000-dig mark for her collegiate career. UF’s all-time career digs leader, Cusack currently ranks third in SEC history in career digs and needs 37 more to tie former Kentucky standout Jenni Casper for second-place all-time. Sophomore middle blocker Cassandra Anderson recorded six kills on .600 hitting with four digs and a team-high four blocks. It marked the 15th time in 24 matches this season that Anderson has charted four or more blocks in a single contest. Junior outside hitter Callie Rivers added six kills and three blocks, while junior setter Brynja Rodgers dished out 18 assists.